After years of civil conflict, baby elephants are a symbol of hope for the parks recovering herds. Gorongosa, Mozambique. Photograph by Joyce Poole. Gorongosa National Park in Mozambique is one of Africa’s greatest wildlife restoration stories, living proof that nature can recover from near collapse, so long as humans protect it and help it to heal. In Gorongosa Park: Rebirth of Paradise, airing Tuesdays, September 22 to October 6, 8:00–10:00 p.m. 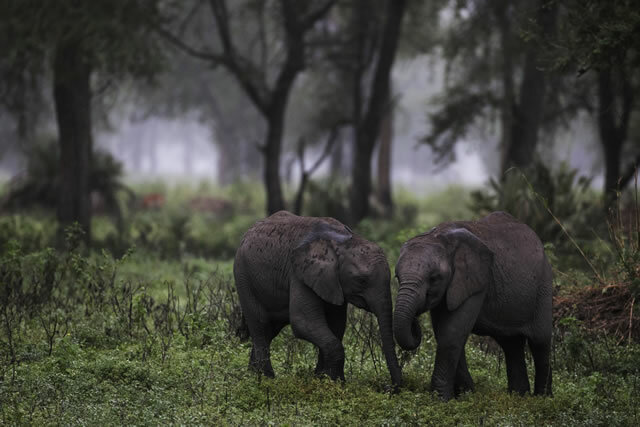 ET on PBS, viewers will join Emmy-winning filmmaker Bob Poole on an incredible adventure exploring Gorongosa, as “rewilding” efforts are made to restore populations of magnificent creatures after a civil war nearly destroyed the park. The success of “re-wilding” Gorongosa National Park is crucial to this East African ecosystem and to the global conservation community. Poole has made it his life’s work to communicate the beauty and importance of Gorongosa to the world. He is joined in the effort by specialists who include his sister, renowned elephant researcher Joyce Poole, philanthropist Greg Carr, who is founding president of the project’s oversight committee, and renowned scientist and conservationist Edward O. Wilson, who serves as a scientific advisor to the park. Together they explore its most remote areas and make new scientific discoveries while telling dramatic stories of war-traumatized elephants who charge humans on sight, lions that are fighting dynastic battles as well as poachers’ snares, and tiny yet epic struggles in the insect world that affect the entire ecology. Every creature plays a part in the rebirth of this complex ecosystem. Gorongosa Park provides an experience unlike that available to any other tourist or visitor. Viewers will see Poole’s vivid re-enactment of an unusually aggressive elephant attack; ride along with the research team at night as they fit GPS trackers onto the manes of lions, bracing for possible attacks from others in the pride; and discover a huge aggregation of some of the largest crocodiles in Africa. PBS invites families to experience the series together and will be making all six episodes available for preview beginning Wednesday, September 16 through Tuesday, September 22 across several platforms, including pbs.org; iPhone; iPad; Android; AppleTV; Roku; Fire TV and Xbox360. For information on where to watch other PBS and local member station content anytime, visit pbs.org/anywhere. Lion researcher Paola Bouley fights for the survival of African lions. Take a sneak peek at what might be the largest crocodile population in Africa. Find out how insect expert Piotr Naskrecki became a scientist. Meet Gorongosa’s very own Tarzan, Harith Farooq; one problem, he has no head for heights. Meet Park Warden Mateus Mutemba & hear what it takes to be warden of a national treasure. Bob Poole takes a tour in a traditional dugout canoe through Gorongosa’s flooded forest. Gorongosa Park: Rebirth of Paradise website goes beyond the broadcast by taking a close look at the captivating stories featured in the series, and showcases web- exclusive video clips, photo galleries, a lion audio recording and a virtual reality video experience. PBS Learning Media, in partnership with Howard Hughes Medical Institute (HHMI), will also launch a website, http://www.pbslearningmedia.org/collection/gorongosa-park/, with several innovative features, including an interactive map focusing on key components of the conservation strategy, a timeline of the history of the park and videos of Gorongosa scientists at work for viewing the park’s researchers in their natural habitat. For wildlife fans who want to get involved in the action, HHMI and Zooniverse have developed WildCam Gorongosa, a new citizen science interactive launching in September with links from pbs.org/gorongosa and the PBS Learning Media site, giving users the chance to identify the park’s charismatic animal residents using never-before-seen photographs from 52 trail cameras in Gorongosa National Park. Identified animals will provide critical information for park scientists, and the most impressive images will be used in social materials to create awareness about the park and its amazing story of resilience. Gorongosa Park: Rebirth of Paradise was produced by Off The Fence.